1. 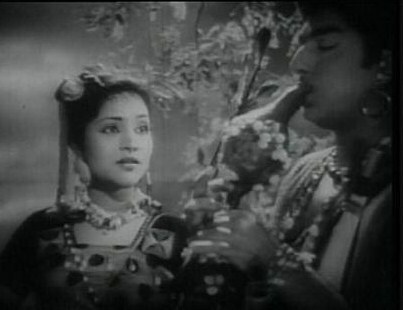 “Jadugar Saiyan” from Nagin (1954). I’ve played this half a dozen times in the past 36 hours or so. I’ve also listened to the whole album a couple of times. I’m ready to call this the best soundtrack ever! I fell alseep with it going into my earbuds yesterday morning, and I felt as though i was drifting off into some sweet dreams. I don’t specifically remember any dreams with a young Vyjayanthimala dancing around (too bad), but it was still all very nice. Also very soothing for troubled times. 3. “Unchi Ediwalo Ne” from Bedard Zamana Kya Jane (1959). Visually, it’s a delightful black-and-white Helen number, one of my favorites, although it is also (I would assume) kind of obscure. I was pleased, after I mentioned this in comments to Memsaab’s now-famous ten favorite Helen songs post, to find a number of people coming over to my blog to check out this song – not only because I always want to lure people over to my blog, but also because it is such a good song, I want to share it with people who might not know about it. I didn’t arrive at this one looking for a Helen number. In fact, I landed here on a search for more Geeta Dutt. And Geeta here does a duet with Mohammed Rafi, which is always good. The song borders on a rock and roll piece, and you know both these singers can get really good when the music rocks. (Although they’re really good in other kinds of music also.) Altogether, I find this one hard to resist, or to get out of my head. Aside from the fact that I can associate this song with a Jayshree T. dance, I think the song is very pleasurable all by itself. Every time I encounter it (and you know that I play that clip pretty often), it gets stuck in my head. It’s hard to describe what about the song appeals to me so much; you can’t classify it, really (except, well, it’s melodic, a little poppy, kind of with some more traditional Indian folk influences?). Let’s just say that there’s great singing by Asha Bhosle, and great music S.D. Burman. That should tell you most of the reason why it turned out so good. That, of course, is “Tadbeer Se Bigadi Huee Taqdeer Bana Le” from Baazi (1951). It is a catchy and laid back kind of number that might naturally get stuck in your mind even if you just hear it, especially with that singing by Geeta Dutt . However, in my mind, I can’t separate it from the visuals and from the context. Geeta Bali and Dev Anand both look great in this. And the context around it make this song pretty funny, in a strange way. Right before she started singing, we saw some character getting slapped around in this rather unpleasant gambling gangster’s den. And the lyrics that she is singing here are about how you should take a chance in life, gamble a little, have a little faith… Meanwhile, the character herself meets a rather unfortunate fate further down the road. So, as I was saying, kind of funny, and ironic, and dark. Yes, I finally got to see Nagin (1954), in its entirety… In terms of plot and character, the best way to describe this, as a lot of people know already, is “Romeo and Juliet in the jungle with snakes.” The snakes are there because the two tribes at the center of the story are engaged in a feud due to economic competition in the sale of snake poison – that part, granted, is a bit different. There’s also a very unwanted arranged marriage that’s going to take place soon (since this is an old Indian movie, after all), and the ending is somewhat different, too (at least the very ending is)… Plus, the execution of this plot, as it progresses, is rather strange. However, I wouldn’t call Nagin exceptional overall in its basic story and plot developments, etc. Not that the plot and characters are bad, but these aspects of the film don’t inspire me to write a whole lot. If you’d like to see a good review that sums it all up very well, see The Illuminated Lantern; this person says everything I might have said if I wanted to take the time to go into so much detail. On the other hand, there are a few things about this film that do inspire me to write something, because they made Nagin a very delightful experience for me. First, there’s the music. The soundtrack, composed by Hemant Kumar (aka Hemanta Mukherjee) is quite amazing. The famous snake-charming song, “Been Music” (which is also the intro to “Man Dole Mera Tan Dole”), actually features the first use in HIndi films of a synthesizer – i.e., the claviolin. (And anyone who’s seen this blog in its earlier stages knows that I can be very fond of synthesizers, strangely enough – I even once promised that they would be a big ingredient here.) Of course, this song is not classic simply because of that claviolin usage; it’s the melody, too. That melody is composed by another music director, Ravi, and the musician Kalyanji Virji Shah has a signficant role in this. (You may recognize Shah from another song that I posted recently…) Together, they produce something that will entrance you and hook you in. I understand that this was a big breakthrough movie for Vyjayanthimala. Not that she hadn’t done great stuff before… For instance, I love some of her dancing that I’ve seen in clips from Bahar, made in1951. But Nagin was a much greater hit than anything she’d been in earlier. Additionally, I think she’s more beautiful in this than in her earlier movies. In Bahar, she still looks like a bit too much of a teenage kid, and I’d say the same thing about a scenes I’ve seen from Lakdi. Even in Nagin, she’s barely 18, if that old, but she is more impressive here. The third reason to be simply delighted by this movie is those crazy color scenes, with those wild sets, near the end. They are so fantastic – simply, totally out-there… And, while they’re very dramatic sometimes, they can also be very funny. There also seems to be a lot of instrumental music in between songs that doesn’t belong to any song, or else it’s just hard to tell which song we’re in (even while selecting the songs through the DVD). It’s really all just one long song and dance through delerium. In a way, this whole great color sequence fits right in with a few dream sequences that appeared in Bollywood movies in the mid ’50s … The Awara dream sequence comes to mind; so does the dream in Pyaasa, as do the great fantasy scenes in Navrang. (I also can’t help thinking of a scene from the 1965 movie, Gumnaam, though I guess that was more of a spoof on the earlier films.) But I wonder if the sequence in Nagin isn’t just the craziest of them all, and the most fun to watch as well. For this part alone, I should probably not neglect giving lots of credit to the director, Nandlal Jaswantlal, and should probably name the whole art department, too. I won’t do that, but if anybody is curious about more of the personnel involved, IMbD seems to have a pretty good listing this time. I’m sure everyone in this long list added a little something to turn this movie based on an old drama into something unique. And by the end, it does turn out to be quite spectacular. P.S. I know I posted some of these clips a while back, when I was talking about different snake movies made over the years. But as far as I know, this one doesn’t really belong with the others, because it’s not a fantasy with people doing snake dances and/or turning into human snakes. There are old-style magical rituals being practiced here and there and, at one point, there’s even a curse created that’s meant to be carried out by snakes, but the supernatural aspect is understated compared what we see in later films. P.P.S. By the way, this seems like as appropriate a movie as any to have reviewed on Lata’s 80th. I think the last movie with Dev Anand that I wrote up was Tere Mere Sapne, in which he played an affluent doctor. In Baazi, made 20 years earlier, the character is not an affluent doctor, but he does fall for one (and she for him). That character is played by Kalpana Kartik. (Unfortunately, there is the matter of a disapproving father, who turns out to be a very bad man…) There is also a vamp who courts him from within the gambling underworld – played most intriguingly, as you can see above, by Geeta Bali. Dev Anand’s character in Baazi lives in poverty…at first. In the first of probably many roles like this, Dev plays a poor man who can’t find a job, who finally manages to acquire some money (which helps him to get treatment for his ailing sister) in a questionable manner…through gambling. So there is a lot of that good old social relevance in this picture, with plenty of discussion about rich versus poor, and no holding back in the moral incrimination of at least some among the rich – a tendency that I will always welcome. (In this movie, there are some real crooked gamblers among the the rich. Imagine that…) Of course, we get treated to some murder and suspense along the way, as well an attempted frameup of the (anti) hero… But keep in mind that this film was made before all those other films you might be thinking of now, and there are a few things that are different, including some nice surprises regarding some of the characters. On the other hand, there are a couple of bigger, thematic things that these films have in common which I do appreciate: As I mentioned earlier with regard to Kala Bazar, they all convey a very strong sense of ethics, and – dark though the world might seem from scene to scene – some kind of justice usually prevails. These films could qualify as ultimate examples of what we’ve all come to know and love as “Indian film noir.” But that name might be a little misleading, because they aren’t really that dark, especially by the end – they actually lift your spirits, at least a little. I have wanted to get this movie for close to a year, ever since I saw it mentioned in 2007, along with its many remakes, over at Bollywood Food Club. I’ve also posted the most famous scene from this sometime back (but will not hesitate to post it again, of course). Now, finally, thanks to the same person who sent me that great movie starring the aunt of the star of this movie, I have had a chance to watch Manichitrathazhu in full, with subtitles. And it does make a difference to know the context of the literal insanity that you might see in the clips. This is a sort of horror film, but it has a lot of comedy to it, and inentionally so. Sometimes, therefore, the humor is a bit dark – or the horror is a bit funny – and thus requires someone who can walk that sort of line, with an over-the-top but still convincing psycho act. Shobana is able to do that and much more. Her acting is impressive in ths film, and her dancing is fantastic. I imagine that this must have made her aunt Padmini proud. Manichitrathazhu isn’t going to give you any deep thoughts or revelations about the world, but it does provide an interesting combination of two different horror/thriller themes, split personality and possesson. And while those themes have certainly been combined before, this plot adds a new angle by including a solution to the problem that also combines the scientific with the supernatural. The scientific explanation may win out over the supernatural, but the remedy for the psychological ailment requires the help of men versed in old magic. That might be the most interesting aspect of the plot; it is certainly a refreshing twist. On the other hand, I couldn’t help noticing a very familiar scenario too, one which would probably grate against anyone with a feminist viewpoint: Here we have a woman gone out of control who needs to be cured by a few expert men. The most famous scene, surrounding the song “Oru Murai Vanthe,” also might look strangely sexist if taken out of context, because these men seem to be acting like voyeurs of her mandness, running like crazy up to those little windows to have a peek. Taken in context, though, it doesn’t seem quite as perverted, because it’s all part of a bigger plan. But it’s still pretty funny in a way. This is a suspenseful time during the film, and they are supposed to be studying her with great anxiety as well as determination to cure her of her terrible illness. But who would not also want run down the hall like crazy and climb up to those little windows just to catch her doing this terrific dance? 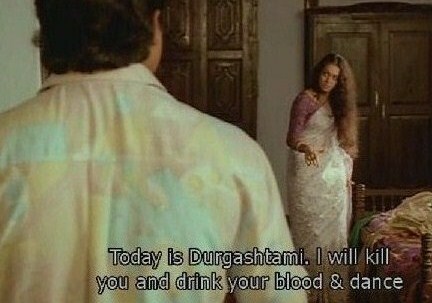 To make this all a little clearer to anyone who hasn’t heard about this movie (and its many remakes), the main character, Ganga, played by Shobana, has developed a psychotic empathy with the legacy of a woman who once lived in the house where she now lives. This woman (who suffered a terrible fate long ago) happened to be a dancer. So, there is an explanation for why Ganga’s madness causes her to break out into bharatanatyam…which does coincidentally make this a wonderful madness to watch. I actually wish there were more bharatanatyam madness here. More often in the movie, she just does the regular split-personality/possession kind of scene. Though she is awfully good at it. I should add, by the way, that Shobana is not the only good actor here. Ganga’s husband, Nakulan, is played by Suresh Gopi, who does more than a decent job. The actor who plays Dr. Sunny Joseph, the shrink, is great; that’s Mohanlal, who I know I’ve seen in a few film clips, at least. And then there’s Vinaya Prasad, who plays the character Sreedevi… There’s a sort of false direction taken in the plot for a while, which puts more of a focus on Sreedevi and Dr. Joseph and some antics between them. I thought it went on for a bit too long, maybe because I already knew too much about the great scenes involving Shobana that would follow sometime soon. (And maybe also because that part of the movie just takes too long, compared to the really important part.) However, I found it easier to get through than I might have otherwise because it was a lot of fun watching Vinaya Prasad. Shobana might be the dancing beauty in this movie, but I found Vinaya Prasad to be adorably cute. The music, admittedly, did not interest me much, especially during those middle parts. The soundtrack, composed by M. G. Radhakrishnan, consists of a soft kind of music that I’ve heard in a few contemporary Malayalam film clips. (That singing sounds especially Malayalam to me – which just goes to show, I might not love absolutely everything from Kerala, though I do love most things from there…) I like “Oru Murai Vanthu,” but mostly because the softer elements are balanced by those wonderful bharatanatyam beats. (And the lyrics are kind of touching, and I do like that pretty duet at the end.) I think I much preferred the bharatanatyam music that Padmini often danced to, where the Tamil percussion came out stronger and everything just seemed to rock more. But that’s just a matter of personal taste; I know that some of this music has been praised a lot, and I’ll understand if people say that they love it. Conversely, I probably won’t understand it if someone claims not to love Shobana’s dance. Several remakes of this movie came out in different Indian languages, and a few were hits. But I can’t imagine a remake of this movie being adequate without Shobana in it. I said close to a year ago, when I saw a few different versions of that “Oru Murai Vanthu” scene, that I thought Shobana’s was by far the best. I feel even more that way now. P.S. It was nice to see that one of the characters was played by KPAC Lalitha. KPAC Lalitha has an interesting story behind her. According to what I read, she couldn’t just call herself Lalitha because there was another famous actress in Kerala named Lalitha (perhaps Lalitha of the Travancore sisters?). So, she added the acronym KPAC to her name, since she happened to have gotten her start in the Kerala People’s Arts Club. This is the same Bhanupriya who starred in Swarna Kamalam. She’s pretty great, isn’t she? BTW, I believe the other main dancer is Lakshmi Gopalaswamy. The song is “Sivakara Damaruka.” Music by Ilaiyaraaja; film directed by Sathyan Anthikad. I can’t find any useful info on this, but I’m glad I found it. It’s quite hilarious, and I love the dancing, especially starting at about 2:10. The song is “Neelakadampin Poovo.” This very pretty scene comes from the film adaptation of the 1952 play Ningalenne Communistakki, which translates as “You Made Me A Communist”; it was the most famous play from the Kerala People’s Arts Club. A bold experiment in political theater in Kerala, KPAC (Kerala People’s Arts Club) was founded in 1950. It was the brainchild of a group of youngsters – G Janardhana Kurup, N Rajagopalan Nair and K S Rajamani – who had close ties with the undivided Communist Party of India (CPI). ‘Ente Makananu Sari’ (My Son is Right), in 1951, was the first drama performed by KPAC. But it was the second drama, ‘Ningalenne Communistakki’ (You Made Me a Communist) that launched KPAC in Kerala’s cultural scene. Soon, KPAC spearheaded a powerful people’s theater movement in Kerala. The play was banned by the authorities on the ground that it encouraged the people to ‘rebel against the government.’ Communist Party of India led a mass movement against the ban and these incidents heightened the play’s popularity. After the ban, the play made history in Malayalam Theater by becoming the first play to be staged more than 10,000 times. It was staged in several cities across the country. KPAC’s second drama ‘Ningalenne Communistakki’ (You Made Me a Communist), was a path-breaking play in the history of communism in Kerala. It was first staged in Chavara Thattassery Sudarsana theatre in Kollam district on December 6, 1952. Thoppil Bhasi wrote the play which portrayed the transition of an elderly man from a conservative upper-caste Hindu into a Communist. Later, the drama was made as a film in 1970 with evergreen hero Prem Nazir in the lead. After fifty-six years, the drama is now coming back with a sequel by Soman, son of Thoppil Bhasi. The sequel, titled ‘Enum Ente Thampranum’ (Me and My Lord), is all set to be staged in August. The drama will have a few characters from the original. That item was written July 9. August has passed, and so far I haven’t been able to find news of the staging of the sequel. Maybe it’s been delayed. But I think it will be interesting to find out more about it, whenever it happens.